1. I already have a merchant facility with another provider, do I need to get a new one? Yes. Each payment gateway requires their own dedicated Merchant Facility. 2. We already have a Payment Express Merchant Facility, can I use that? Yes. You should be able to use this, but we may need some changes at the Payment Express end. Please let us know and we will check. Please also be aware that the annual fees are higher for existing Payment Express Customers, but the monthly/per transactions fee may/may not apply. 3. Does your solution work in my country? Our solution is supported in all countries where the Payment Express payment gateway is available. Please check Payment Express Website – Connectivity Information. 4. Do I need to contact Payment Express? NO! We resell and include Payment Express gateway as part of our solution and we can therefore manage all aspects that you would need. Should you end up going directly to Payment Express then the annual fees for our solution are at a much higher rate and you wont be able to benefit from our bulk buy rates. 5. I don’t see my bank as a supported Payment Express bank, does that mean I need to switch banks? No. Please speak with us as there are often other solutions we can use that don’t require you switching banks. 6. My Live Merchant Facility has message "Payments In Test Mode", how do I fix that? Please note: in earlier releases the Environment appeared under the PayPal section on the Merchant Facility. This field relates to Saleforce Production, not PayPal. We recommend moving it to a more relevant section for user clarity. 7. I tried to start the batch processor and I get the following error: "The Environment type must match the main Payment Gateway user details". The environment field (previously PayPal environment) and the Payment Gateway Environments in your Merchant Facility need to match. Eg: If you have a sandbox or dev Payment Gateway credentials listed, then the enviroment needs to be set to sandbox, if the Payment Gateway credentials are live, then the enviroment needs to be set to Production, etc. 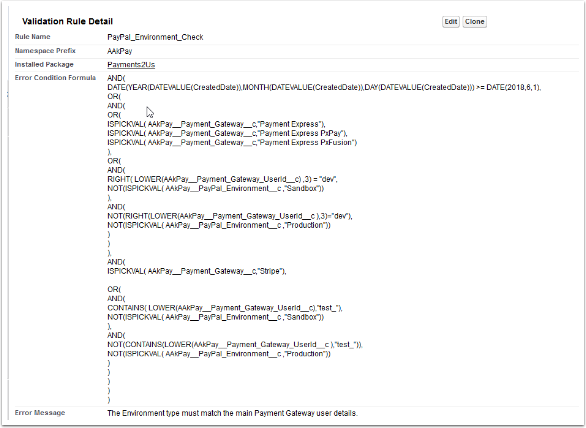 Note: This Enviroment Field is not referencing and is not impacted on whether the Salesforce instance is in Production or Sandbox . We strongly recommend not using a copied Live Merchant Facility that's been copied across for testing in a Salesforce Sandbox, and the user should removing Payment Gateway credentials and/or make it inactive. Use a Demo facility to test in Salesforce Sandbox settings for testing. If the username ends with “Dev” and you have Payment Express as the gateway, the environment must be set as Sandbox. If the username DOES NOT ends with “Dev” and you have Payment Express as the gateway, the environment must be set as Production. If the username starts with “test_” and you have Stripe as the gateway, the environment must be set as Sandbox. If the username DOES NOT starts with “test_” and you have Stripe as the gateway, the environment must be set as Production. You may have multiple Merchant Facilities, you will need to check all of them. The error message will show regardless of which Merchant Facility you are currently on and trying to start/stop the processor(s). Starting/Stopping the processors on one Merchant Facility will start/stop all Merchant Facilities. See below for the validation rule affecting this area.